Alciato at Glasgow: Emblem: Consiliarii Principum. Les Conseilliers des Princes. In stabulis Chiron erudiisse suis. Assideat quisquis Regibus, esse decet. Estque homo, dum simulat se populo esse pium. It is said that Chiron brought up in his stables the sons of heroes and the great Achilles. He shows us that anyone who sits in counsel with kings must be a teacher who is half a beast, a centaur who is half a man. He is the beast when he attacks supporters and tramples on enemies. He is the man when he feigns compassion for the people. iustitiae & pietatis imagine populum sibi devinciunt. Luy Centaure my-homme, & demy-beste estant. Et ses deportemens, & plus insignes marques. Ou feint que des sujets il est fort soucieux. gnent avoir à la religion & à justice. 1. 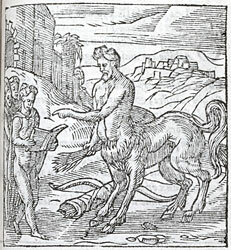 Chiron, the wise centaur entrusted with the education of Achilles, Aesculapius, and other noble figures. Centaurs were creatures combining the physical and mental characteristics of a man with those of a horse. They were wild and uncontrolled, and came to symbolise humanity descending to savagery. Even the civilised Chiron, the educator, retained violent potential.